Career Opportunities for Graphics Designer in Bangladesh. Although graphics designing is a decent profession, its honorarium is completely dependent on the skill of the designer. But, it’s quite easy to earn twenty to thirty thousand Takas in this profession. And if you ask where the top salaries are then it’s in the newspapers, TV channels, and Add Farms. Also, in this sector, this profession is very attractive where experienced and professionals earn Lakh Taka in many of the cases. However, when you’re working as a graphics designer in Bangladesh, they need not maintain nine to five office schedules. Even if you’re unwilling to work under different ownership then you can build up your business entity. Despite this is a challenging field, it might not be possible to survive as a graphic designer when you’re not ready with skill, experience, and unique ideas. It’s possible to find out the presence of Graphics Design in every sphere of life with a creative eye. It’s beyond the imagination of the scope of the graphics designer in Bangladesh. There is a need for absolute creativity and graphics design in all the cases like designing an e-commerce site or mobile application interface, crafting tiles for household use. Also, it’s the job that needs while packing manufactured goods in an amazing packet so that it be attractive mobile covers or even designing the dresses we wear. Also, in any creative job sector has the requirement of graphics design without any doubt. Although there was a time when a graphic designer could get hired strictly on their creative portfolio, most employers are looking for designers with a more complete and well-rounded education. As employers like to hire those who are with a college degree, a certificate in the field, or an associate’s degree, may be sufficient in some cases. But, fledgling designers are much more likely to land a quality job only after earning a bachelor’s degree according to the experts and foreign context. If you’re in lack of a degree you can join the institutions or the online programs so that you can get good salary job. And yes, we should also know about the salaries and earning of the graphics designer in Bangladesh. Based on factors including experience, education, type of employer and geographical location, salaries for graphic designers are variable across the country. While the top 10 percent of graphic designers earned over $77,490, the median national annual wage for graphic designers was $45,900 according to the latest survey. Although it never hurts to start early in any field, it’s particularly important when it comes to graphic design. Students should take classes in art history, drawing, graphic arts, and website design while in high school. By designing and producing the school newspaper or yearbook, they can put their emerging skills. Despite tantamount is the development of solid practical skills and software fluency, graphic design requires a good eye and a creative mind. 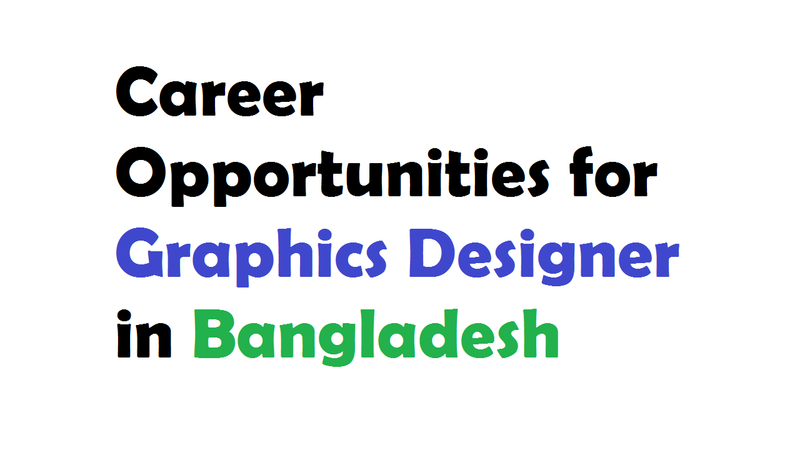 Now, let’s know how to become a graphics designer in Bangladesh. Some skills are very hard to learn on your own and not every job needs a degree. It means that a degree is less required than a creative and skilled mind in this career. But, if you’re having a degree on graphics designing then it carries weight with clients and graphic design firms when you’re applying for a job. Apart from these, studying for the degree teaches you vital aspects of graphic design. A lot of information isn’t available through searching Google or attempting a process of trial and error from learning the software to understanding the history of design and how design bias impacts your audience. As you simply can’t know what you don’t know, experienced, skilled professors and the right combination of art, marketing, advertising, and writing classes. When you’ll do these, they will help you learn the information as well as skills that you need to succeed in the graphic design industry. You’ve decided that a job in graphic design when the time comes to choose a career. If you’re successful in this profession then it’s not only going to ensure a steady paycheck but also allows you to combine your gift for creativity with your computer skills. The commercial art industry, specifically, in advertising, marketing, and identity branding are the working fields of the graphics designers. Also, you may find work at a specialized design firm as a member of a collaborative team or work independently as a self-employed contractor as the professional association for designs reports. As a niche helps narrow your focus to a single area, you can get really good at what you do. It’s important to have a solid understanding of all aspects of graphic design for many graphic design firms. But, apart from the rest of the professionals, the focus sets you. As your portfolio proves your skills and understanding of the industry, it must be noticeable. As soon as you graduate, your school should help you develop an impressive portfolio that helps you get a job. While choosing your very best work to showcase to clients or potential employers, you want to focus on quality over quantity. Along with consisted of about 10 to 12 examples, your portfolio should include a handful of your best work that demonstrates your abilities and niche skills and interests.